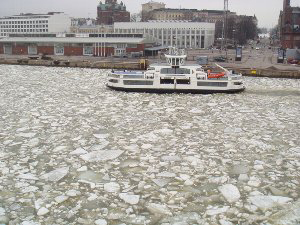 Right after Kodaira Dojo’s Hanami (cherry blossom viewing party), I left for Helsinki to celebrate Finland Aikikai’s 40th anniversary on March 30th. It was said that Europe was experiencing a very cold winter. Indeed, the road from the airport to the hotel was deep in snow and the sea still frozen. It made me shiver just to see it. The celebrations were held in a big gymnasium in the town of Vanraa, about 30 minutes outside Helsinki. About 250 men and women took part in the activities, on 500 mats. It was the Easter holidays in Europe, so people from not just Finland, but Sweden, Russia, and Estonia also came. Endo Shihan of Hombu Dojo, who also taught at the seminar, got his start in aikido at Gakushuin University and entered Hombu Dojo after his graduation. I taught him, and we took turns teaching aikido at Gakushuin. Endo Shihan has long taught at Hombu Dojo and has a completely different style of teaching than me. My method of teaching involves no explanation. I throw and then I am thrown by my partner. That’s all. I then walk around during practice and correct people, demonstrating the proper way of doing the technique, and have people throw me. There is no need for translation. The technique’s name is Japanese so I only need to use very basic English. 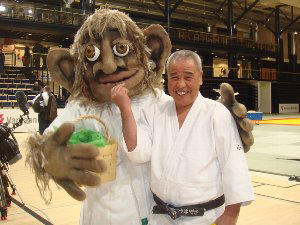 Endo Shihan is the type who’s flowing taisabaki requires a theoretical explanation. Since he explains in Japanese, an interpreter is needed. Since our styles are so different, over the years the Finnish Aikikai has developed along these two different lines, so at the seminar, students who follow his style only practiced when he was teaching, and students who followed my style came to my class. It was a seminar, so there was a percentage who attended both classes. In Japan, ordinarily gasshukus aren’t so formal, but overseas, students have yudansha cards and must show them when they register for a seminar. They receive an official stamp that proves they have attended, and unless they go to a certain number of seminars in a year, they cannot get promoted, so everyone at seminars is very serious. In the commemorative demonstration, yudansha in three groups showed a typical practice. The tempo was fast so viewers wouldn’t lose interest. The invited Shihan from Sweden and Norway, Mr Urban and Mr Mouliko, especially stood out. They came to my seminar in Helsinki in 1977 and took my ukemi. Their participation helped to consolidate the Finland Aikikai’s base. They have been angels to the Finland Aikikai. In the children’s demonstration, an ogre dressed in keiko gi appeared and gave a performance that kept everyone laughing. Finally, in the shihan demonstration, Endo sensei did flowing taisabaki techniques and I did basic suwariwaza to the great applause of everyone. After the demonstration there was a celebratory party held on the second floor in which 130 people participated. It seemed that most of the people had never had on a keiko gi. As one woman put it, “Huh? Who are all these people?” The Japanese Embassy representative, ToshiyukiIwato gave a speech and we presented the Finland Aikikai with a round trip airplane ticket and support to stay in Kobayashi Dojos for one person under the Musubi Kikin program. 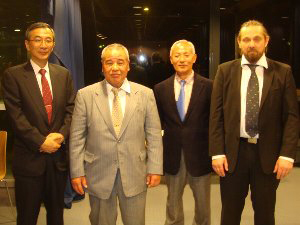 Aikido Kobayashi Dojo’s long relationship with the Finland Aikikai dates back to when one of my students, Toshikazu Ichimura went to teach through the Sweden Aikikai after his graduation from Toyo University. A young participant who had been taught by him from Helsinki returned to Finland and rented space in a dojo shared by a karate and judo club and founded an aikido club in 1970. This was the beginning of the Finland Aikikai. Aikido Kobayashi Dojos was founded in 1969. It was an era during which there were only two aikido dojos in the suburbs of Tokyo. At that time, aikido wasn’t very well known in Japan either. I was first invited to Helsinki in the summer of 1977. At that time, there were only six dojos in Finland. There were about 40 people who participated. 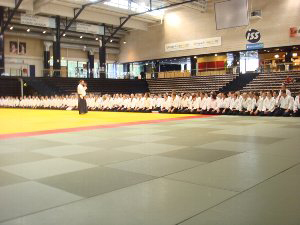 This was Helsinki’s first aikido seminar and demonstration. The next year, Kobayashi Dojo’s uchideshi, Igarashi shihan, was dispatched to Finland for one year, and young Finnish men and women in their twenties came to live and practice in Kobayashi Dojos in Japan for three months. They returned to build the Finland Aikikai and expand aikido there. Today there are over 70 places in Finland where people are practicing aikido and there are a number of 6th dans teaching. It was truly gratifying to have been invited to, and have participated in the 40th anniversary seminar and demonstration. I pray for the continued expansion of the Finland Aikikai and wish them the best of luck.